With 13 berths, six container cranes and direct rail access, the 570-acre (230 ha) Dundalk Marine Terminal remains the largest and most versatile general cargo facility at the Port of Baltimore. Containers; automobiles; farm, construction and other roll-on/roll-off (ro/ro) equipment; wood pulp; steel; breakbulk; project cargo — if it moves on a vessel, Dundalk can handle it. Baltimore’s proximity to the Midwest’s major farm and construction equipment manufacturers has helped the Port become the leading U.S. port for the export of combines, tractors and hay balers, in addition to importing excavators and backhoes. Over the past several years, Baltimore has ranked as the nation’s top automobile-handling port. Several auto processors maintain operations at Dundalk, which offers approximately 300 acres of storage. Dundalk’s direct rail access also allows unit trains to routinely deliver farm and/or construction equipment to the terminal. Dundalk’s size, combined with rail access, makes the terminal ideal for handling large breakbulk and project cargo. The terminal’s expansive covered storage space can easily house weather-sensitive cargoes, such as high-quality steel coils, raw rubber and wood pulp, one of the fastest-growing cargoes at the Port. Size: 570 acres (230.8 ha). Cargoes: Containers, breakbulk, wood pulp, ro/ro, autos, project cargo, farm and construction equipment. Berths: 13 general cargo berths; draft is 34 ft. (10.4 m) at four berths, 42 ft. (12.8 m) at seven berths, and 45 ft. (13.7 m) at two berths. at any of the Port’s terminals on an as-needed basis; the Grove GMK7550 is an all-terrain mobile hydraulic crane with a reach of almost 200 feet. Inside Storage: Ten sheds totaling 789,820 sq. ft. (73,377 sq. m). Outside Storage: 20 acres container storage; 20 acres breakbulk storage; 300 acres automobile storage; 100 acres ro/ro. Rail Access: Norfolk Southern provides direct rail access to all berths and sheds. Two rail storage yards total 9,300 ft. of track. Two 2,000-ft. storage tracks and five unloading tracks, ranging from 1,500 to 1,800 ft.
Highway Access: 2.5 miles from I-95; 1.5 miles from I-695 with easy access to other major interstates. Together with automobiles and light trucks, equipment such as tractors, agricultural vehicles, trucks, wheeled cranes and the like makes Baltimore the number-one port on the East Coast for handling ro/ro. The “Fairfield” area of the Port includes four specialized terminals for handling and processing autos, light trucks and similar ro/ro cargo. Currently, portions of the terminal are leased to Daimler-Chrysler (Mercedes-Benz) and Auto Warehousing Corporation (AWC). These specialized terminals process autos and light trucks. Typically, this includes accessorizing, minor repair operations and final dealership preparation. The terminal is adjacent to public berths also owned by the MPA. Another berth began operation in mid-2014. A vessel discharging new vehicles can berth within a few hundred feet of the facility. A second facility, owned by the MPA and leased to ATC Logistics of Maryland, is Masonville Marine Terminal. This state-of-the-art facility consists of nearly 50 acres, with a 94,000-square-foot building, also designed for processing automobiles. Access is a mere half-mile from the vessel. Size: Total terminal area is 150 acres (60.7 ha.). 61 acres (24.7 ha) are developed for auto terminal. Gates: Trucks are loaded at truckaway area inside terminal. Pier 3 — 1,175 ft. Depth – 49 ft.
Pier 4 — 832 ft. (253.6 m). Depth – 49 ft. (14.9 m). Sheds: Vehicle processing buildings, no cargo storage sheds. The Intermodal Container Transfer Facility (ICTF) at the Port of Baltimore moves cargo between bulkhead and railhead in record time. Ports America Chesapeake operates the Port’s on-dock railyard. Baltimore’s ICTF, which is located adjacent to the Port’s modern Seagirt Marine Terminal, has quickly emerged as an integral link in CSXI’s impressive nationwide intermodal system. With six trains daily, CSXI offers direct service to the Southeast and Midwest and seamless connections to the rest of the continental United States and Canada. The Seagirt ICTF offers shippers and steamship lines landbridge connectivity to the rest of the country. The dedicated truck entrance of the automated gate system speeds the pick-up and delivery process for cargo. The facility features a separate gate for domestic shipments. The Seagirt ICTF uses the latest in intermodal equipment and a skilled labor force to keep the ICTF running efficiently. Two transtainers — rubber-tired gantry cranes that straddle the rail tracks — facilitate the rapid loading and discharge of two trains simultaneously. Toploaders are used to mount and dismount containers to and from chassis. 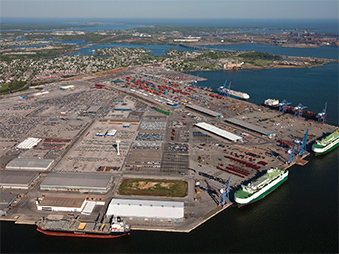 With its location adjacent to the Seagirt Marine Terminal, cargo flows effortlessly between the two facilities, while the intra-terminal Colgate Creek Bridge connects to Dundalk Marine Terminal, the Port’s largest general cargo facility. The International Longshoremen’s Association, whose members supply the facility’s labor force, and the Steamship Trade Association of Baltimore have an agreement that allows the ICTF to operate 24 hours a day, seven days a week. So, when your cargo has a train to catch, make sure it stops where your ship comes in — at the Seagirt ICTF. Size: 70 acres (28.3 ha.). Cargoes: International and domestic containers. Tracks: Four loading tracks; two storage tracks; one run-around track; track length is 3,750 ft. (1,143 m). Equipment: Two 40-long-ton (40.6 mt) transtainers; two top loaders. Rail Access: CSXT provides direct service. Highway Access: Less than one mile and two traffic signals from I-95 and its connections to other major interstates. Over the past century, North Locust Point has adapted and changed to meet the varied needs of the Port. It has welcomed immigrants, served as a cargo pier for the Baltimore & Ohio Railroad, and handled many different types of breakbulk, as well as liquid and drybulk cargoes. North Locust Point has ample storage capacity. With 19 acres (10.1 ha.) of outside space, the terminal can easily accommodate the storage of steel, bulk, breakbulk and project cargoes. Size: 90 acres (36.1 ha). Cargoes: Wood pulp, lumber, latex, steel, paper and containers. Berths: Three finger piers with 34-ft. (10.4 m) depths; all are 1,200 ft. (365.8 m.). Cranes: One 45-long-ton (45.7 mt.) container crane with steel and bulk-handling capabilities. Inside Storage: One shed with 182,603 sq. ft. of available covered storage space. Outside Storage: 19 acres (10.1 ha). Rail Access: Direct connection to terminal by CSXT. Direct rail access to all berths. Highway Access: 2.25 miles (3.6 km) to I-95, with connections to other major interstates. The Seagirt Marine Terminal stands as a working monument to the innovative and progressive spirit of the Port of Baltimore. Opened in 1990, Seagirt features the latest in cargo-handling equipment and systems. The design behind this high-tech facility stems from one simple principle: keep the cargo moving. The MPA entered into a Private/Public Partnership (nicknamed “P3”) with Ports America Chesapeake, which now operates 100% of both vessel and terminal activities. The “P3” allows for joint partnership between the MPA and Ports America for 50 years to further develop the Seagirt Terminal, adding an additional berth with four Neo-Panamax cranes and an operating berth depth of 50 feet. The computerized gate complex serves as the nerve center for the 284-acre (112 ha) container terminal. The Seagirt computer system’s electronic data interface capabilities automatically receive and send cargo and equipment information to the terminal’s steamship line customers, helping them generate timely reports that can boost their efficiency. Four Neo-Panamax cranes are capable of handling ships with a draft of 50’ and upwards of 14,000 TEU, adding to the seven Post-Panamax cranes present. Sixteen rubber-tired gantry cranes, at $1.5 million each, help stack containers, thus allowing for more space on the terminal. Seagirt averages nearly 40 container moves per hour per berth. Its practical yard layout places the storage area directly behind the berths. Enhancing Seagirt’s efficiency is the adjacent Intermodal Container Transfer Facility, which brings the railhead to within 1,000 feet of the bulkhead. The Port’s progressive labor-management approach complements Seagirt’s advanced equipment, technology and systems to further its reputation as one of the nation’s most productive terminals. Size: 284 acres (112 ha). Berths: One 1,225-ft. (373.4 m.), 50-ft. deep (15.2 m.) container berth. Two 1,028-ft. (313.3 m.) container berths and one 1,071-ft. (326.4 m.) berth; 45-ft. (13.7 m.) drafts. Cranes: Four 50-long ton new Super Post-Panamax cranes. Four single-hoist and three dualhoist 50-ton (50.8 mt) Post-Panamax container cranes; 16 rubber-tired gantry cranes (RTGs). Outside Storage: 134 acres (48.5 ha). Rail Access: Direct connection to the adjacent ICTF by CSXT and Canton Railroad. Highway Access: Many of the major transportation arteries are within minutes of the Port’s terminals. East/West corridors include I-70, and North/South corridors include I-81, I-83, I-95, I-97 and I-895. When it’s time to hit the road, no marine terminal gets you rolling quicker than South Locust Point. While all of the Port’s general cargo terminals enjoy excellent highway access, South Locust Point has Interstate 95 — the “Main Street” of the East Coast — literally running past its front door. Used for forest products, as well as some ro/ro and autos, South Locust Point also includes the Port of Baltimore’s cruise terminal. Carnival Cruise Line and Royal Caribbean International both have cruise ships based at the Port of Baltimore year-round. Destinations include the Bahamas, Bermuda, the Caribbean and New England/Canada. The cruise terminal’s location being 2.5 miles from Baltimore’s Inner Harbor and 40 miles from Washington, D.C. lends itself to convenient shopping and sightseeing opportunities for cruise goers. Size: 79 acres (32 ha). Cargoes: Forest products, ro/ro, automobiles. Berths: Three 36-ft. (11 m) draft general cargo berths . Cranes: One 100-short-ton (90.7 mt) revolving gantry crane. Inside Storage: 835,000 sq. ft. (77,574 sq. m). Rail Access: Direct connection to terminal by CSXT; rail to rear of sheds. Highway Access: 0.75 miles (1.2 km) from I-95, with connections to other major interstates. Location: South Locust Point Marine Terminal. Berths: 1,139 ft. (347.2 m.) with a depth of 35 ft. (9.1 m.). Sheds: 60,000 sq. ft. (5,920 m.) for cruise operations. Parking: More than 1,500 parking spaces adjacent to passenger building with capacity for additional parking immediately adjacent.